Mystical transformations famously take place in a single moment. One minute you’re ordinary and the next “the great door, that does not look like a door, opens,” in the words of Stephen Graham. That’s pretty much what happened to Erin Hanson when she was climbing in the red rocks near Las Vegas. Yes she had laid the groundwork by studying art at Otis College of Art and later at UC Berkeley (with a detour into bioengineering). But then all at once—as she was hanging onto a rock slab fifty feet above the desert floor–she knew she had to paint rock, and she knew exactly how to paint it. The result has been an outpouring of robust, textured landscape paintings that seem to soar beyond genres (they’ve been called abstract mosaics). 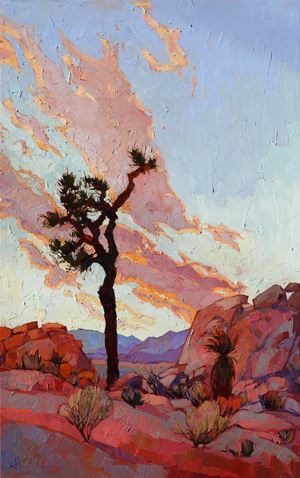 A frequent visitor to Joshua Tree and Anza-Borrego, rock climber and artist Erin Hanson explains the path that brought her to her authoritative style. Where did you grow up and what was your first experience of landscape (when you first realized it was important to you)? I grew up as a young child in Silverlake (Los Angeles). Home was very concrete and gray and the nearby hills of Griffith Park were only occasionally perceived through the smog that dominated Los Angeles in the 1980′s. When my family would escape for yearly camping expeditions, the clear air and crisp greens were like paradise. When I was a little older, we moved to Palmdale and commuted daily over the San Gabriel Mountains into La Canada for school. Palmdale, located in the Mojave Desert, was like being in the paradise of camping all of the time! We were surrounded by empty land and the foothills of the San Gabriels were just a short bicycle ride away. This is where I first decided that landscapes would be the most beautiful thing in the world to paint. I loved the windy desert days, the rolling tumbleweeds, and the colorful sunsets seen through the Joshua Trees, the San Gabriel mountains blushing red and pink in the waning light. I loved that the desert had actual weather, and one year I experienced real Christmas snow on the ground at my house! You’ve talked about your dad’s role in encouraging you. Any specifics? What did your parents do? 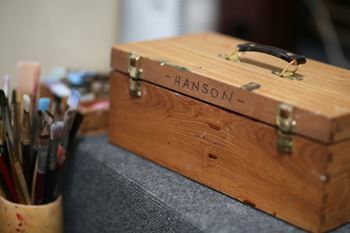 Any artists in the family tree? My parents are not painters, but they are both musicians. Growing up understanding the importance of daily practice to hone your skills, it was natural for me apply that diligence to painting. My dad used to tell me that to become a master painter, I should begin by drawing five life sketches every day. I drew everything around me from the cats to the trees. I remember spending Saturday mornings sitting on the bathroom sink so I could draw my face profile in the mirrored door. You graduated in a very left brain field (bioengineering) yet gravitated away from calculus to art. Do you approach art with the eye of a scientist? People do laugh to hear that I was a bioengineering major in college. To me science and art were never very separate in my mind. Science is just the art of observation, and the technique of art is certainly a science. I won two of my school’s science fairs: one for a year-long naturalist study of a specific valley in the San Gabriels, and one for programming a tic-tac-toe computer game that could never loose. I always appreciated Da Vinci’s equal ability in both fields of art and science, and the book The Agony and the Ecstacy, about Michelangelo’s life, always interested me – especially how he would sneak into graveyards at night to dig up bodies to learn human anatomy. I apply science to all the paintings I create. In fact I have developed a unique method of painting in oils after over twenty years of trial and error. You seem to have a special affinity for desert places. Did you go to the desert as a kid? What did it first dawn on you that you liked dry, scrubby places? Living in the Mojave Desert definitely inspired my first love for the desert. I got my own German shepherd puppy when we moved to Palmdale, and most nights of the week I would walk out with my dog deep into the desert. We would wind through the Joshua Trees in the dark and silence; I would collect bones while Rascal chased rabbits. 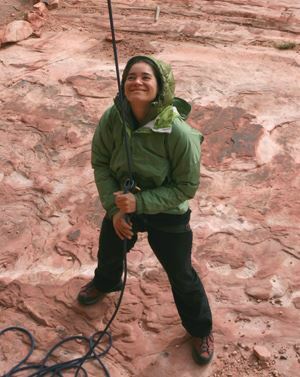 Tell us about your move to Las Vegas and how you started rock climbing. After I graduated from UC Berkeley, I started my own business buying and selling retail goods, and I moved to Las Vegas to follow a business lead. On the first day of my arrival, my apartment didn’t have electricity yet, so I camped out at Red Rock Canyon. I got to the campground late at night, and I had no idea that I had just stumbled on the most beautiful scenery in Nevada. I had already decided to use this move to Las Vegas as an excuse to get back into painting, so I woke up at dawn the following day and set up my easel at the top of the little hill near the campground. When the sun came out and hit the eye-popping expanse of Red Rock Canyon and Rainbow Mountains, I was excitedly surprised! Later that day, I met my campground neighbors and they invited me to rock climb with them. I was lucky enough to fall in with a university rock climbing teacher and a veteran mountaineer. I loved experiencing the rocks hands-on, and rock climbing was an addictive thrill. The next day we all moved in together and started climbing several times a week. You are a real student of rock. What can you tell us about painting (or climbing) the red rock of Canyon de Chelly versus the granite of Joshua Tree, and other varieties. When I moved to Las Vegas, I decided to get back into painting (the last job I had as an artist was working in a mural studio near my high school). Continuing my childhood maxim that practice makes perfect, I decided to create one painting every week. Since Red Rock Canyon was the most beautiful landscape around Las Vegas, and the rocks were the most interesting thing there, that is what I painted. As climbers we were often already hiking before dawn to avoid the heat, and I experienced many colorful sunrises over the red, pink and white striped sandstone. I loved the way the rocks reflected the light around them, as well as their interesting abstract shapes. The rocks were both a challenge to overcome with my hands as a climber and a challenge to learn to paint with the brush. I wanted everyone to see the bold beauty of the rocks as I saw them. After two years of climbing and painting red rocks, I started experiencing other landscapes like Joshua Tree National Park and southern Utah. With my eye constantly seeking subtle color variations and interesting shapes in the landscape, I truly saw the desert in a whole new light. Lately you’ve been painting more pastoral landscapes in central California. You have said that you approach the rolling fields somewhat the same visually as when painting rock faces. Please explain. When I moved back to Southern California and experienced the rolling hills of Paso Robles, I was immediately grabbed by the entirely different landscape and color scheme. I had hardly ever used green in my paintings (unless a scrubby desert green!). I love a challenge, and I leapt at it. I spent a week driving around the back country roads between Paso Robles and Cambria, taking thousands of photos of oak trees, hill shadows, and curving horizon lines. 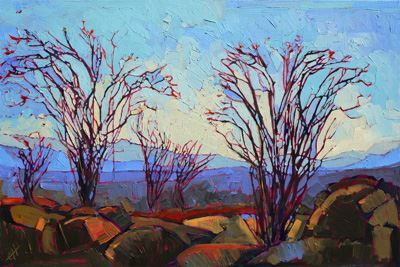 When I returned home ready to paint, I naturally applied everything I had learned painting rocks and desert buttes to painting oak trees and rolling hills. I treat an oak like a rather fluffy rock, but with the same angular planes and sharp contrasts. Trees and hills reflect light just as rocks do, so I got the hang of it pretty quickly. Are there painters who’ve inspired you? Other influences in art, music, books? As a child, I was mostly inspired by the classic Renaissance artists and the impressionists Monet and Van Gogh. To this day my father still buys me art books for Christmas, which always inspire me, including some of my favorites: The Group of Seven, Ansel Adams, Andrew Wyeth and Cezanne. As a professional artist, I speak to a lot of people who encourage me to look up various contemporary artists. I love loose plein air artwork, the classic California impressionists, and abstract expressionism in landscapes. I am drawn to color, simple landscape shapes, and unique viewpoints. Growing up without television, my family read for pleasure every night. I enjoy reading about artists and their unique perspectives. I listen to audio books all day while I paint, everything from English classics to science fiction. Getting lost in a book helps relax my mind and lets me concentrate better on the details of painting. How do you physically approach landscape exploration and painting? Hike in? Backpack? Take photos or paint on site? Go solo or with friends? Now that I am a full-time artist, I set aside several times during the year when I travel out into the wilderness to get inspired for months of painting. I often hike solo, waking up before dawn every day to get the best lighting across the landscape. I love monsoon season in the desert, with the lightning and the giant dramatic cloud formations. 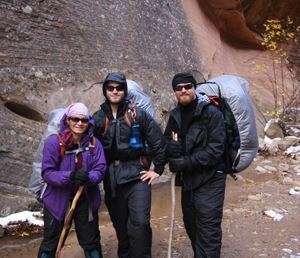 Lately, I have been going backpacking with my younger brothers, once on a five-day trek across Zion National Park, and once backpacking the eastern Sierras in November. I always carry a camera with me, and my eye is constantly roaming for a unique perspective, an interesting tree, or a beautiful piece of light. Even driving in Los Angeles, I find myself getting excited about a sunset sky or a grove of eucalyptus trees. I have transformed Pasadena’s ficus trees into several beautiful paintings. You now live in Burbank. Where do you go to get near the rock or wilderness? Yes, I live on the top of the Burbank hills, where I can see the entire valley beneath me. Somehow Los Angeles has almost completely obliterated its smog problem, and I can see clear across to Downtown and beyond most days of the year. I see every morning dawn on the Griffith Park hills across the Burbank valley. I am constantly surprised by how different the light appears each morning. I feel like I could paint these hills every day for a year, and each day would produce a completely different painting. Aside from the natural beauty of Los Angeles, I plan my seasonal escapes into the desert and other landscapes. Last year I visited Texas for the first time, as well as driving the entire California-Oregon-Washington coastline. This spring I am hiking in Glacier National Park (Montana) and the Canadian Rockies. I am always excited to explore new vistas, although I return yearly to some of my favorite haunts, including Zion National Park, Joshua Tree, Borrego Springs, and Paso Robles. What are the challenges you’re still working out regarding landscape painting? Any places you especially want to get to know in the future? I am always challenged while painting. I always try to figure out a better way to communicate the light and drama of the landscapes I see. Each new landscape is an exciting new color palette, a new study in composition and perspective. I am still experimenting with painting trees, clouds, grasses, reflections, and, yes, rocks. After a few more decades of painting landscapes, I hope to be able to fully capture those fleeting moments of perfection I discover in the landscape and transport my viewers to the world as I see it: bold and truly beautiful. Visit California Desert Art to view the online article!